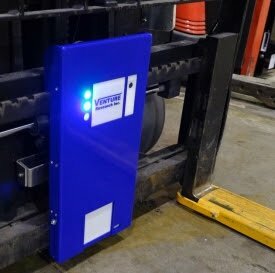 The intelligent Forklift Reader from Venture Research can autonomously manage a pick, drop, stack and move operation using an array of RFID and IoT sensors. PLANO, Texas — July 25, 2018 — Venture Research, Inc., a leading global supplier of RFID and IoT solutions has announced the next generation ofIndustrial Forklift Readers. The Venture Research solution is designed from the ground up to withstand both indoor and outdoor harsh environments of forklift usage with its IP65 rating while incorporating the state of the art in RFID and IoT technology. With the swappable rechargeable Li-ion battery, the reader can be quickly installed to full operation in just 5 minutes on a standard type 2 or type 3 carriage forklift.